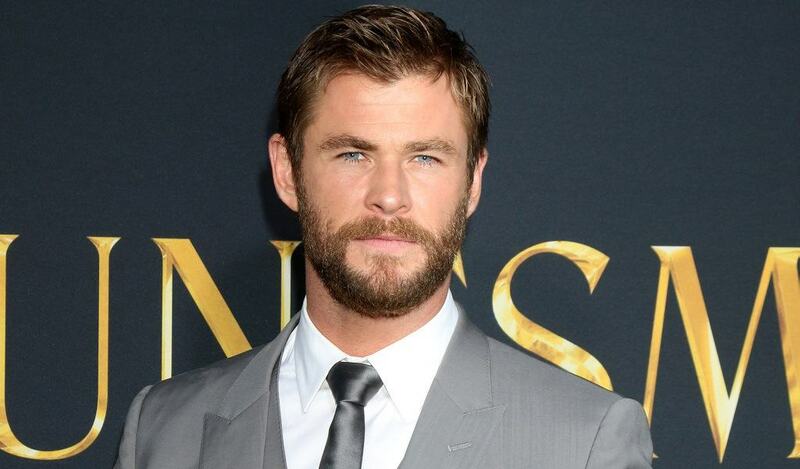 Chris Hemsworth was just another Aussie actor trying to make it big in Hollywood when he catapulted to fame with the Thor and The Avengers franchise. Tall, hunky, with piercing blue eyes and the ability to bulk up overnight, he seemed to be the perfect actor to play the hammer-wielding Norse God with great hair. Today, Hemsworth is one of the biggest actors in Hollywood, and his style, from his wardrobe choices to his beard is making an impression on male and female fans alike. Hemsworth started his acting career in his native Australia, playing roles in local TV shows like Guinevere Jones and Neighbors. He landed a recurring role in a popular soap Home and Away as Kim Hyde. He later left this role to pursue more Hollywood projects. Like any other aspiring actor, Hemsworth entered Hollywood through minor roles but he was fortunate enough to work in a couple of big-budget productions early on. He started with minor roles such as the role of George Kirk, Capt. James Kirk’s father in Star Trek. Later he got a small role in a thriller A Perfect Getaway with Mila Jovovich. Last but not least, he was a clueless hunk in the horror-comedy Cabin in the Woods. His talent was clearly making an impression since he got lead roles in bigger flicks like Snow White and the Huntsman and later in the remake of war flick Red Dawn. However, Hemsworth only became a full-pledged A-lister after playing the hammer-wielding Thor, a role he reprised in The Avengers and in Thor: The Dark World. In 2014, People magazine named him the Sexiest Man Alive. Hemsworth reprised his role as Thor in the fourth Avengers movie and Thor: Ragnarok in 2017. He is set to play the same in the next Avengers movie set to be released in mid-2018. Besides his acting skills, Chris has said some things that have inspired many. 1. Keeping an open mind is always important. 2. People who put themselves on the line and sacrifice their own safety for the greater good and for others, and anyone in any profession whose concern is the welfare for other people instead of the individual, are inspiring and important. 3. As kids, our experiences shape our opinions of ourselves and the world around us, and that’s who we become as adults. 4. I think it’s important to be aware of different people’s styles and how you adapt or change or steal their ideas. 5. Here’s your opportunity, now you’ve got to make something of it. Chris Hemsworth is a typical Aussie, one who prefers the laid-back, surfer style over anything frilly or formal. However, his rise to fame also showed a subtle shift in fashion options. His basic outfit includes classic jeans and well-fitting tee combo, with a good leather or casual jacket. He also manages to throw in a little bit of casual even when forced to wear a business-attire, such as when he is seen pairing a soft cotton tee under a suit jacket, giving a cool, edgy vibe to an otherwise stuffy ensemble. Well-built, tall and never without long-ish locks, Hemsworth effortlessly pulls off the hunky surfer look on and off the set. While he sported a new look with cropped, texture hair in Ragnarok, it seems that he prefers having a little bit of length between the movies. Fans can often see him with 3-4 inches long hair which he either ties into a man bun or keeps down just a little bit over the shoulders. 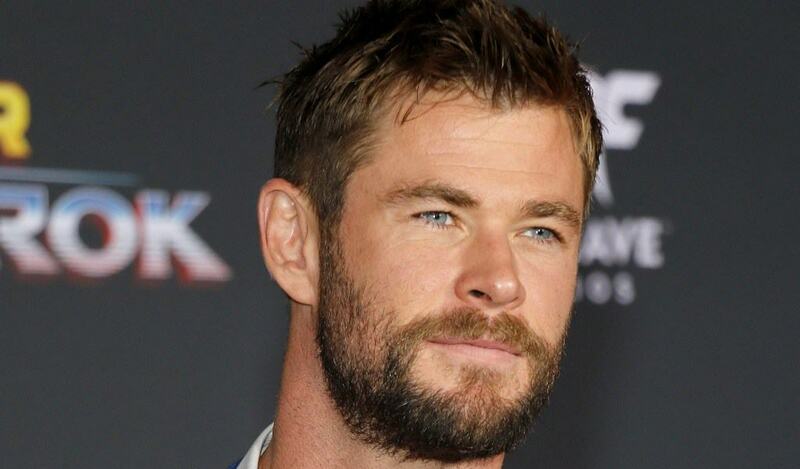 Chris Hemsworth has always sported a bearded look for most of his career and this is perhaps the reason why he is known as one of the manliest leading actors in Hollywood today. While he has been seen stepping out with a clean-shaven face once or twice, most of his appearances on the red carpet or off-set were with a slight stubble, a full-on or 5 o’clock shadow beard. His facial hair style on Thor: Ragnarok is perhaps one of the most emulated styles today. In fact, it is so popular that it could easily be one of the best beards of 2018, and it’s really no secret why. This is a standard short beard and compared to other styles, it can be grown effortlessly. Almost any guy who can grow facial hair can acquire this style, but it does take a little bit of planning. Let your beard grow for about a week. To get the same kind of fullness that Chris’ beard has you need to let the hairs grow for about 5 to 7 days. This allows any thin areas or bald spots in your beard to fill in and gives you enough hairs to work with once you need to trim and shape your beard. Trimming starts by going down halfway from the top of the sideburns to the jaw in downward strokes. By using a good beard trimmer, set the guard at 3 or 3.5 to achieve the right height. Set the trimmer to level 4, while letting the hairs on the chin and jaw to remain longer like you are doing when trimming a goatee. Moisturize regularly. In a GQ interview, Hemsworth shared that he uses natural coconut oil to keep his beard moisturized. This oil not only keeps facial hair soft and healthy, but it also helps moisturize the skin underneath the beard and prevents its dryness and irritation. Keep the defined shape by trimming your beard twice a week, but not more than that. Facial hair color also plays a major role in giving the beard definition so that it really defines the shape of the face. 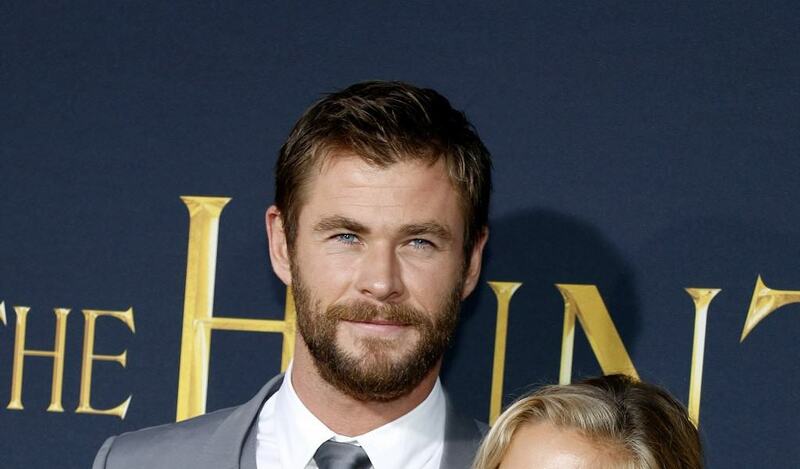 Hemsworth keeps his beard color a mix of light and dark brown to give his beard depth and texture. If you want the beard of the same color, you can always try dying your beard. With so many beard dyes out there, the only thing you need to do is ensure that you chose the quality one. This style is pretty low-maintenance which makes it great for any guy who likes to sport a full, thick beard but wants something that won’t take too long to groom. If this is your first time to trim and shape facial hair, you can visit a barber and inform yourself on the basics of beard trimming. A fashionable yet manly casual style makes Chris Hemsworth not just a great actor but also a style icon. Photos from: Jean_Nelson / depositphotos.com and PopularImages / depositphotos.com.